I'm so happy—and so ready!—for a long holiday weekend that today's post falls into the Delirious Design category. 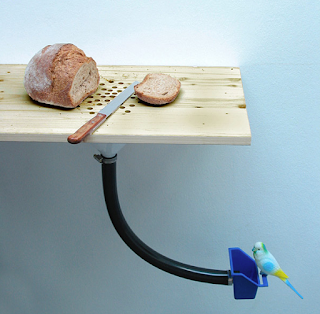 Created by Curro Claret, the concept is perhaps better suited for a commercial bakery than a residential kitchen. Crumbs from sliced bread are funneled into a seed cup; it's a gesture that falls somewhere along the reduce-reuse-recycle scale. Questions, suggestions and submissions welcome.